Look out Steve Jobs, here comes trouble with a capital “T”—and a lowercase “i” in front of it. According to Digital Beat, UK manufacturer X2 Computing announced they have a new tablet PC device called the iTablet. X2 has been making tablets for a while and for several different reasons—business, military, personal. We haven’t found too many other US reports of this new tablet device, but with a name like iTablet—don’t go beating yourself up now Steve—it’s bound to be talked about in the States soon. 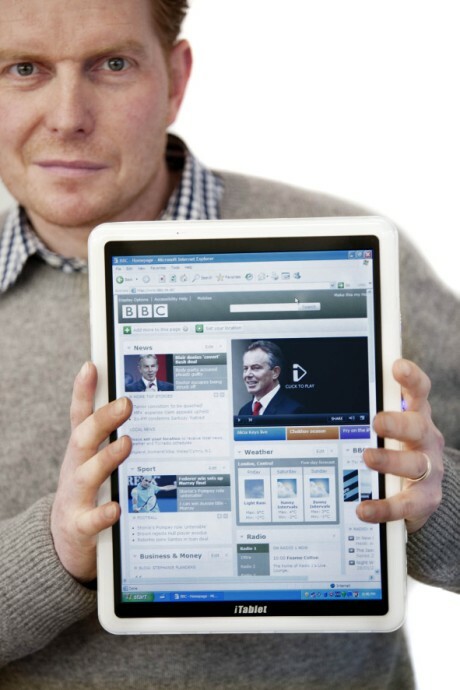 In fact, the Guardian UK basically reported that the only reason why this tablet device got any press today was because of its Apple-like name. “X2 wouldn’t normally get much in the way of press coverage because it’s one of the companies that has been quietly supplying tablet PCs to the industrial and commercial markets, where they have many uses in retail, healthcare, logistics etc,” says the Guardian UK. According to reports, the X2 iTablet has a 1.6GHz Intel Atom N270 processor, 512MB to 2GB of memory, and a 10.2-inch XGA (1024 x 600 pixel) screen. The dimensions are 252 x 192m and the thickness runs from 28mm to 35mm. It weighs 1.18kg (2.6 pounds). There’s a choice of operating system: Windows 7, Windows XP Tablet Edition or Linux.